She had a bumper sticker supporting Sanders. 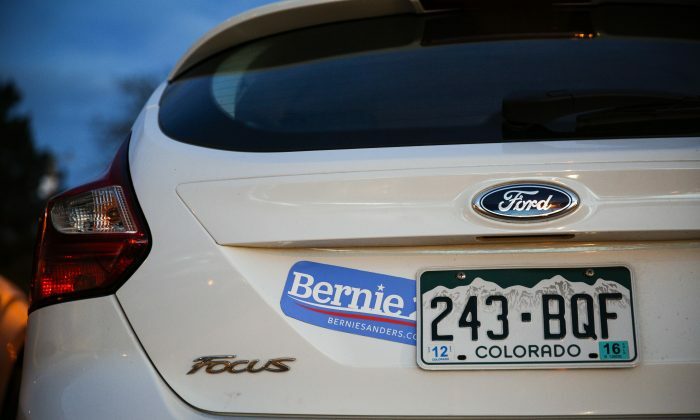 When tow-truck driver Ken Shupe stopped in Asheville, North Carolina, to help Cassy McWade, who had been in an accident, he noticed one thing—a bumper sticker supporting Democratic nominee Bernie Sanders. Shupe is a Donald Trump supporter who works at Shupee Max Towing in Traveler’s Rest, S.C.
“Every business dealing in recent history that I’ve had with a socialist-minded person, I haven’t got paid,” Shupe told Fox Carolina, a conservative news station. Bernie Sanders is a self-ascribed “Democratic-Socialist,” and Shupe is not a fan. “With an ‘e,’ not a ‘u,'” he clarified. “I’ve had some horrible experiences in the last six months with towing cars for this mindset individuals, in that I don’t get paid. They want to argue about a $50 tow bill, and it turns into just a drama and a fuss. And I said, you know, I’m not going to associate with them, and I’m not going to do any business with them,” Shupe said. So he refused to tow the car. “Something came over me, I think the Lord came to me, and he just said get in the truck and leave,” he told a local ABC station. “He goes around back and comes back and says ‘I can’t tow you.’ My first instinct was there must be something wrong with the car,” McWade told News 13 on Wednesday. She has a Bernie Sanders bumper sticker on her rear fender and a yard sign in her rear window for Sanders. McWade, 25, has psoriatic arthritis, fibromyalgia, Chronic Fatigue Syndrome and early-stage Crohns, and says the handicapped placard was hanging on her mirror when Shupe arrived. Shupe says he did not know that McWade was disabled. “Had she been disabled, would I have towed her car? No ma’am. I would have pulled forward and sat there with her to make sure she was OK until another wrecker service showed up to get her home safely, but I still would not have towed her car,” said Shupe.